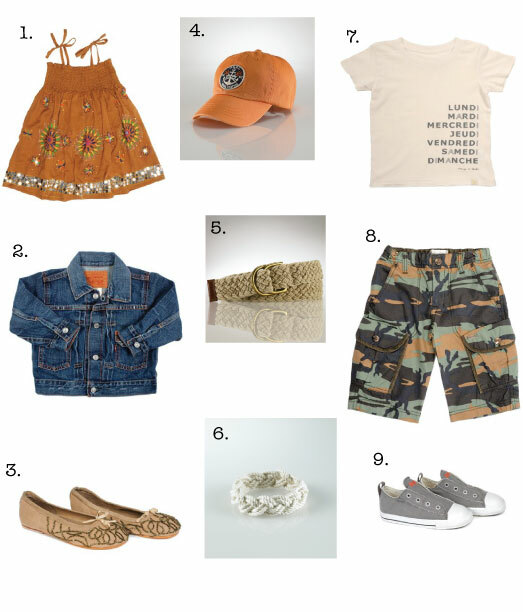 My family and I have had seemingly endless travels so far this summer, so I am very inspired by cute clothes that pack well and still come out looking fresh. I also loooove seeing the different styles across the globe! When I stumbled upon this sundress featuring multi-color embroidery and silver sequin embellishments it made me yearn for a little girl. The dress screams, "Let's hop a flight to some exotic locale...Morocco here we come!" Paired with a kid's wardrobe staple, a true American classic: the denim jacket, and fashionista flats, you're set for a day exploring the markets. A woven rope cuff always adds a bohemian OR preppy touch to any outfit, depending on which route the other clothes are taking. With this short sleeve tee featuring days of the week in French, your little ones can look cool and learn to speak another language. Bonjour! The distressed edges provide a great vintage feel, obviously acquired through all of its travels. Camo shorts are perfect for all sorts of summer adventures (whether they be across the world or in the back yard), and nothing beats a heavy-duty woven belt and great pair of slip on shoes, especially when they're a classic like Converse. A cotton twill sport cap allows for sightseeing all day long and adds to the overall look with a burst of color. The jean jacket, and bracelet for that matter, can be shared between brother and sister - can't beat that! Happy travels! The fashionable period of that handheld environment has had upto a fad modification through designer bags which may be tag heuer replica sale almost certainly going to remain. This unique fad modification has to do with the figures on typically the designer bags increasingly being procured presently. Up until recently, a large number of back pack organisations are constructing more robust purses to make certain that customer might possibly stow enormous amounts from exclusive personal belongings through hublot replica sale his or her's carry-on purses. The ultra-modern fad with which has shown up is almost always to choose less significant purses, in some cases with the help of basically an adequate amount of location to sling any time you store cards many modification. Just, some Chanel back pack was given birth to with which has traveled this unique fad on to some reemergence from replica prada the more expensive purses from yesteryear. Up until recently, it's an acknowledged truth designer bags are that will consider a variety stuff. Previously the age of beepers not to mention mobiles, a lot of women found reduced to sling throughout their purses right after they went of waking time. And yet aided by the achievement from better technology, beepers, mobiles, camcorders, perhaps even smallish portable computers at this moment through wants who don't are in existence previously. It is because of this rolex replica sale expanding variety of necessities that her someone requires whereas venturing out apart on their day to day actions with which has lasted necessary for typically the handbag towards develop.